Moving out of his office whilst the owners redevelop the building has been unsettling enough for private investigator Varg Veum. But now he is back behind his desk and the woman sitting across from him is telling him that she is his sister. Varg tells her that he found a birth certificate and adoption papers amongst his mother’s things but he admits that he had been reluctant to look for her. His sister in turn had visited their mother back in 1975, to find out who her father was. However big sister Norma Johanne can’t tell Varg anything about the yellowed newspaper cutting he also found amongst their mother’s papers, an article about a jazz band called The Hurrycanes. In fact Norma has really come to Varg to ask him to find her god-daughter Emma, a 19-year-old trainee nurse who disappeared several weeks ago. Her Bergen landlord and flatmates say that she packed up and moved out but they don’t know where to and she isn’t answering her phone. Emma’s father happens to live in Bergen but he left the family under a cloud when Emma was only two years old. Norma Johanne has tried the police but they think she has just taken off somewhere and aren’t interested in pursuing an investigation. So she has come to Varg. Explaining that only the police can check Emma’s bank cards and phone, Varg agrees to investigate. Varg's first try is Emma’s last known address starting with the landlord's flat on the top floor of the building. There is not much there for him except the landlord’s wife who is drunk and available, her husband being away on business. Varg makes his way downstairs to Emma’s apartment where he speaks to one of the flat mates. She seems disinterested and vague, explaining that they hadn’t really known Emma, she had simply answered their advert for a housemate. But she does remember her once talking about trying to see her father. Emma’s father must be Varg’s next step. There he is greeted by the father’s second wife, Emma’s stepmother, dressed in a tracksuit and impatient to get out on her twice daily run. She dismisses any talk about “that hysterical daughter”. There is a sizeable motorbike chained in the carport and Emma’s father, dressed in leather and denim, is hostile too. He doesn’t want anything to do with Emma. He doesn’t care what, if anything, has happened to her. He never really knew her anyway. Varg continues his search: Emma’s schoolfriend, now studying in Berlin; Emma’s college; her fellow students. But he draws a blank and his impression is that nobody cares much about the girl except perhaps her friend in Berlin. The past begins to haunt both Emma’s story and that of Varg as he and his new sister make their tentative first steps in connection. Shadowy motives and past traumas begin to emerge alongside connections to a biker gang. Another death closer to home ensnares Varg into real physical danger but still the mystery of Emma refuses to yield its answers until the end of this surprisingly poignant story. 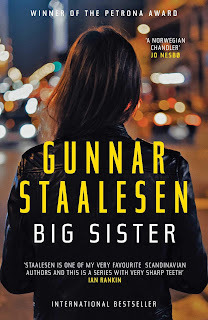 BIG SISTER is the first novel that I have read in Staalesen’s mammoth, established and prize-winning Varg Veum series. I can only hang my head in shame that it has taken so long for me to arrive here. But this also means that there is one thing I can vouch for: Staalesen weaves Veum’s past into the narrative so deftly that the reader can pick up the thread of his life, in as much as it relates to the story, seamlessly. Neither too much is explained nor too little. My hat is doffed. This is the ninth of the UK published Varg Veum series and reads easily and fluently in this translation by Don Bartlett, veteran translator of Nesbo and Knausgaard. Bartlett himself once described Staalesen’s crime writing as “soft hard-boiled crime”. I suspect Staalesen pays homage to Raymond Chandler and his American West Coast creation Philip Marlowe in its details: the bottle of spirit in the office desk drawer; Norma Johanne Bakkevik – does that ring a bell for Norma Jean Baker/Marilyn Monroe? Even the title of this novel recalls Chandler’s own titled work “The Little Sister”. But perhaps I’m getting carried away. 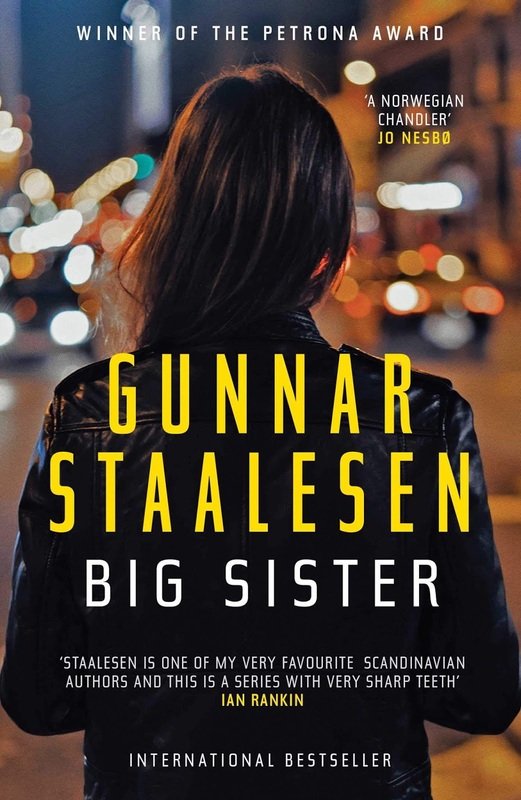 In BIG SISTER, Staalesen has written a densely interwoven mystery and it's down to Varg Veum to pick apart the strands; a solidly satisfying private eye tale crafted with detailed storytelling, pace, wit and a compassionate eye.